As Easter gets closer and closer you’re running out of time to do more promotion and marketing. Hopefully you have everything under control and you aren’t feeling too stressed out (right?). 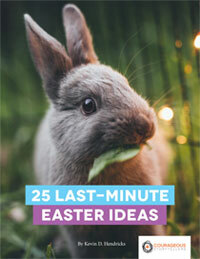 We’ve got some last-minute Easter ideas to help. These aren’t big crazy ideas that will consume your final weeks and days, but simple and basic things—you might already be doing some of them. Easter times on website: Double check to make sure the times for your Easter services are easy to find on your website. That means prominent and above the fold. We did an informal survey one year and found only 9 of 20 churches had Easter info on the front page. Doh. Cohesive branding: Be sure the Easter imagery you’re using on fliers, social media, and everything else is present on your website. Share past Easter content: You likely have content from previous Easters that’s still relevant and useful. Repurpose it for this year.